This is less of recipe- then a call to throwing together the contents of your fridge- when it is too cold and you are too cheap to buy ingredients. 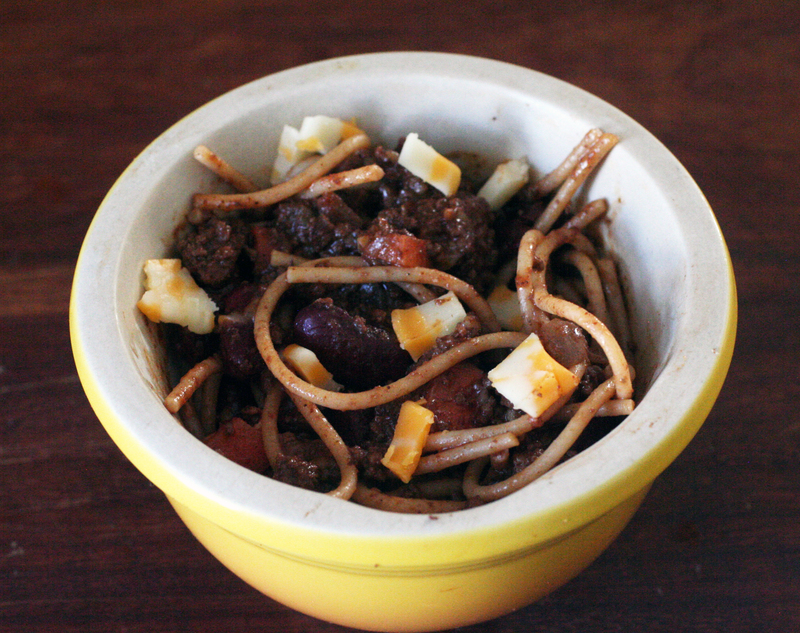 Here’s to hearty weekday sustenance! Jess P. I feel like you make a vegetarian version of this? with tiny pasta (which has a special name) and maybe tomato? This is also sort of a riff on italian wedding soup– which i love– but thought that sausage was a nice shortcut to making own meatballs. 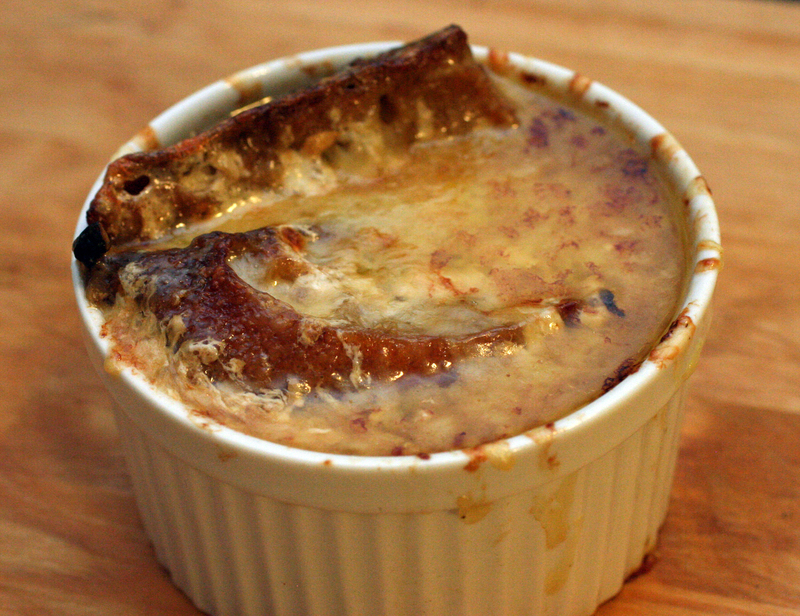 But a recipe for that soup– inspired the finish- crack an egg in a swirl around. Totally fine w. out this last step- but it makes it super extra hearty. needless to say, you can increase recipe amounts and get more experimental with add-ins and spices. 1 bunch of kale (in a moment of true laziness i bought a pre-cut version from trader joes the other day. i am embarrassed and will never do it again. it was all stalk. but yes, totally convenient. used half a bag) escarole would also be perfect. other dark green also acceptable. if i had used a real bunch of laciento kale i probs would have taken out the stem. Pour a generous glug of olive oil (tablespoon or two) and tablespoon (or two) of butter. Saute onion for a few minutes. Add garlic and chili flakes until fragrant. When onion has begun to soften, add sausage. Once looking pretty cooked (a few minutes). Add Kale and cover to cook down. Once that is ready, add beans and stock. Simmer to blend all flavors. Before eating, can crack and egg in a swirl w. a fork. I’d personally do this with only the portion i am reheating. But not sure that is totally necessary to keep separate like that. 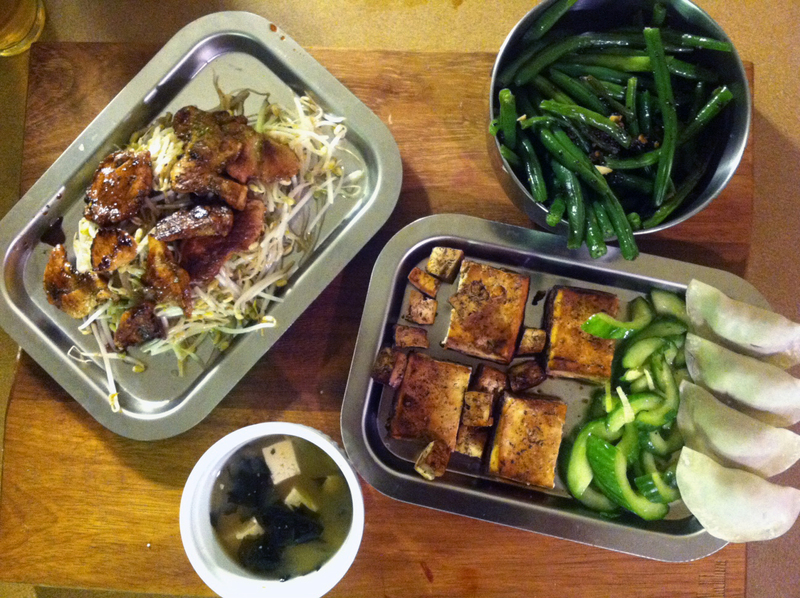 These recipes come from Harumi’s Japanese Home Cooking. The book I bought when I got back from my trip to Japan- 2 years ago- thinking I would use all the time. And I just now- finally made the soup. Heat the water and just before it comes to a boil, add the dried fish flakes and simmer for 1-2 mins over low heat. Turn off the heat and leave the fish flakes to sink to the bottom of the pan, then strain. Can freeze extra dashi. Heat dashi stock in saucepan. 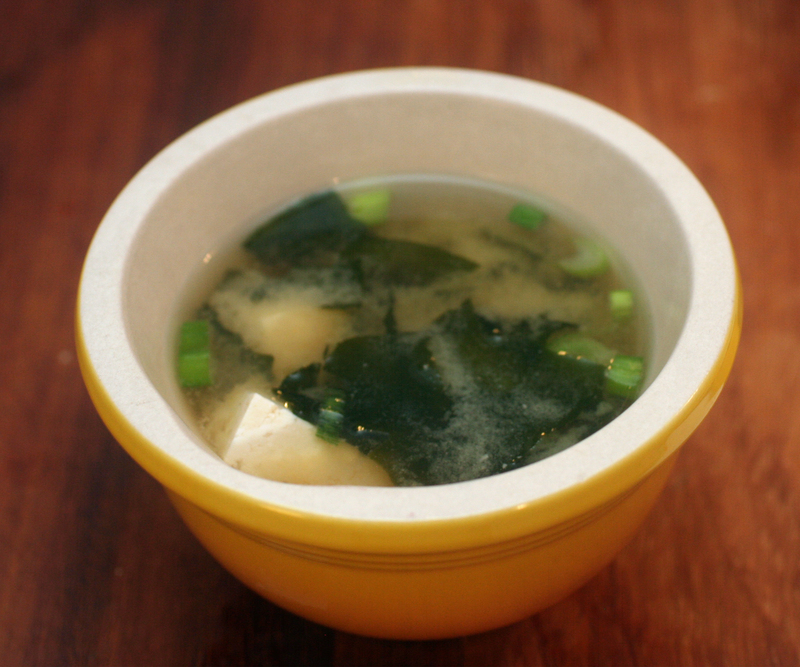 Just before it comes to a boil, add the miso and stir until completely dissolved. Soak the seaweed in water until soft. Drain and cut into bite size pieces. Cut tofu into ½ in square pieces. Add tofu then seaweed to the soup. Heat thoroughly, taking care not to let it boil. Garnish with spring onions. In a separate frying pan, heat a tablespoon of oil over high heat. Add sliced garlic. When aroma is released, add bean sprouts and stir-fry. Season w. salt and pepper. Put bean sprouts onto a serving dish and lay the slices of pork on top. Pour any remaining juices from the frying pan over the pork. I’ve wanted to make this recipe every since I stole/borrowed this Alice Waters book from Chrissy. The book In the Green Kitchen: Techniques to Learn by Heart has some great very basic techniques- for example- it taught me the proper way to fry an egg. Or, there will be a whole chapter devoted to the mortar and pestle- as I mentioned in the post on green tomatillo salsa. She has her friends- share recipes. 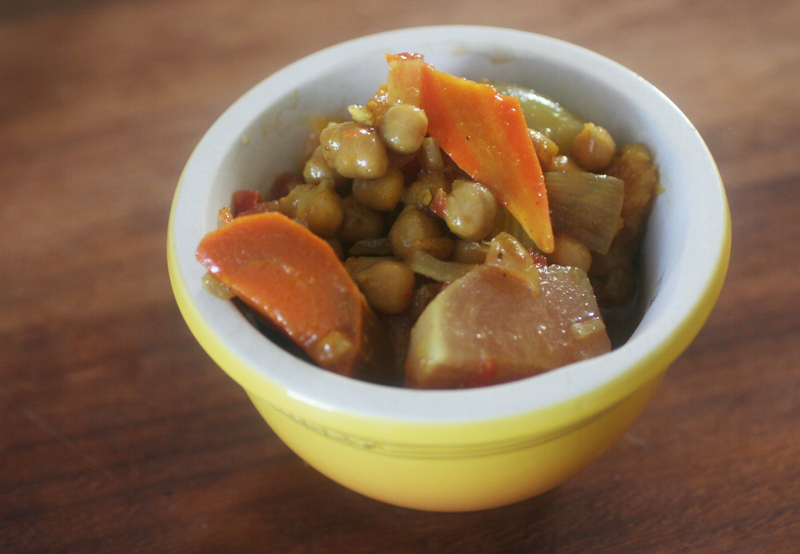 This one is by Joyce Goldstein and it is called Moroccan-style Braised Vegetables. And the reason why I finally made it- is because I was able to use a lot of vegetable from my CSA. So very seasonable, very fall. I’d say this is closer to soup/chunky stew. And before you ask, yes, you should use dried chickpeas. Not only do they taste way better- but this broth you cook it in- is the base for the braise. And man, it was tasty, I will definitely use for future chickpeas. What always deterred me is that this recipe seems a bit overcomplicated. But put on some Netflix and just let it ride. Oh and yes, you should also use the whole spice seeds- toast and grind- you will get way more flavor out of it. Drain the chicpeas, put them in a medium pot, and add water to cover by 1 ½ inches. Add the onion, cinnamon stick, chile, olive oil, and generous pinch of salt. Bring to a boil. Reduce the heat to maintain a simmer, and cook gently until chickpeas are tender, about 45 minutes [check, a forgot to time it but I think they might have taken less.] Taste for salt. Remove from the heat and allow the chickpeas to cool in the cooking liquid. Preheat the oven to 400. Bring a large pot of water to a boil and season with generous amount of salt. Peel and halve the carrots and cut on the diagonal into 1-inch segments. Trim the turnips and cut into halves and quarters. Cook the carrots and turnips in separate batches until just tender, about 5 minutes. Spread the vegetables on baking sheet to cool at room temperature. Peel and seed the squash and cut into 1-inch chunks. Put squash on a baking sheet, drizzle with 1 tablespoon of the olive oil and toss to coat evenly. Spread the squash out to an even layer, season with salt, roast in the oven until tender, 15 to 20 minutes. Set aside at room temperature. Lightly toast the cumin seeds, coriander seeds and saffron [in a dry skillet], and grind to a powder with a mortar and pestle or in a spice grinder. Add the turmeric and cayenne, and stir to combine. Warm a large [large- i used my 5 qt all-clad- this makes a ton], straight-sided skillet over medium heat. Add the remaining 3 tablespoons olive oil, followed by the onion, celery, and a pinch of salt. Cook for 5 minutes, stirring occasionally. Drain the tomatoes and cut into ¼ inch dice. Add the tomatoes to the skillet and cook for 2 minutes or until the vegetables are tender. Add the spices, garlic, and ginger and cook for 2 more minutes. Add the chickpeas, and the cooking liquid, and bring to a simmer. Add the squash, carrots, and turnips. At this point there should be a nice amount of broth in the pan- like a chunky soup. If not, add water as necessary. Taste for salt, and simmer for 5 minutes. Recommend to serve with buttered couscous or saffron rice (ask me for recipes- I haven’t tried yet) and pass a bowl of harissa at the table. I think this Moroccan couscous would work well too. Harissa recipe- I didn’t make but would have if I had the ingredients so am including. Toss 5 dried ancho chiles on a hot griddle until puffed and fragrant. Put the chilies in a bowl, cover with boiling water, soak for 20 minutes, and drain. Roast, peel and seed 1 large red bell pepper. In a blender or food processor, purée the drained chiles, and peeled pepper with 4 peeled garlic cloves, ¾ cup olive oil. 1 tsp red wine vinegar and salt to taste. Thin with water if desired. Also made this week: Turkey Burger. Yum! Check out its hot new pic. There was a phase where my mom made “fat burning soup.” I think the idea was similar to the (myth?) of celery– that it takes more calories to eat than you actually consume? Well, this tastes nothing like that soup– but gazpacho makes me think of it- as it always feels like the most healthy and fresh soup. 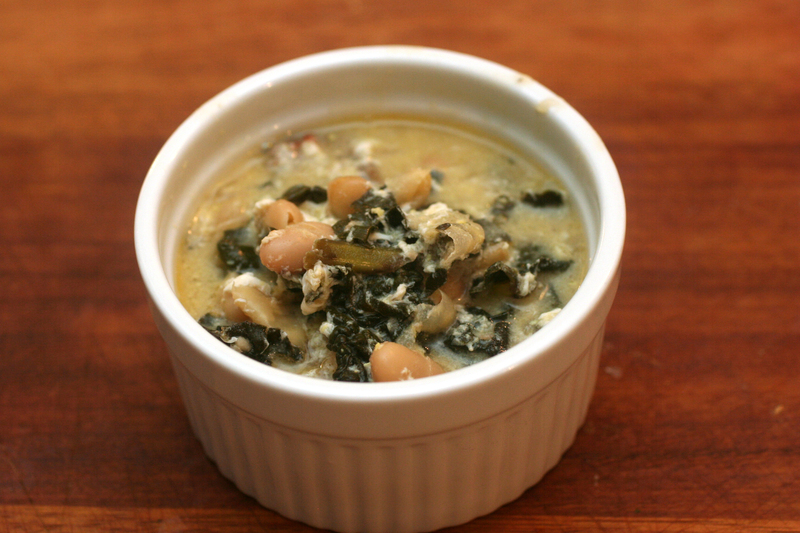 This recipe is packed with flavor and comes from The Voluptuous Vegan. Obviously, I would never have found a recipe from this on my own. But last summer, this gazpacho was brought to the vegeatrian potluck thrown by the tech dept at the museum. It was so tasty, i asked for the recipe. Normally, I get lazy and skimp on garnishes. But these really add something- so I encourage you to use. I also had thought about adding a serrano pepper to add some heat to the soup or garnish— in the end, i didn’t- but the idea is out there, if you want to. 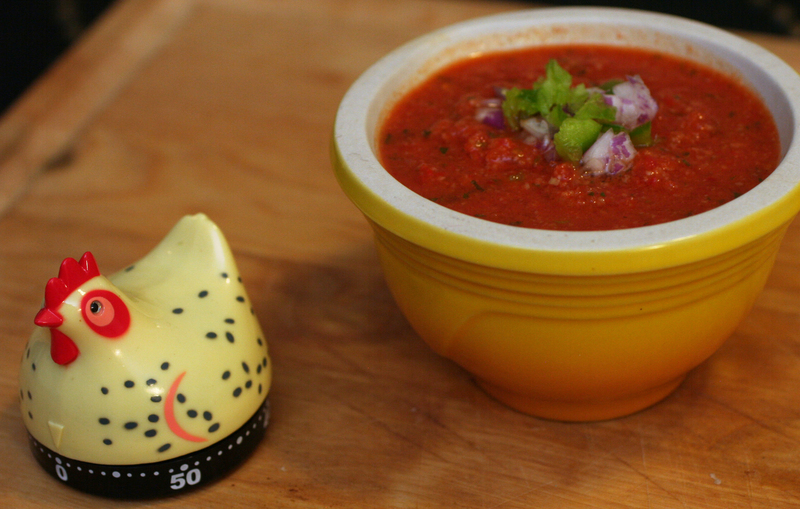 I do also have a more traditional gazpacho- an Ina Garten recipe– elsewhere on the blog. Also- check out my new rooster timer! I’m in love. Thanks to Alexis- for encouraging the purchase at Fish & Eddy’s. To roast red pepper (directions as cribbed from swordfish recipe): Preheat to 400. Line baking sheet with foil. Lightly coat whole red peppers with olive oil. Cook for 30-40 mins. Flip over once during. The peppers will get charred and black on outside- that’s what you want. When done, take the peppers out. I put in a tupperware, and cover with lid for 15 mins. This steams and makes them worlds easier to get skin peel. When cool, using hand or knife, to slide off skin, seeds and top. Remove crusts from bread. Place 2 slices of bread in a small bowl, cover with water and soak for 5 minutes. Remove the bread and squeeze it like a sponge to rid of excess water. Discard the water. Remove the charred skin from the pepper. Scrape of stems and seeds. and chop into 1-inch pieces. To the blender, add the pepper, scallion, paprika, garlic, vinegar,1/4 cup of the oil, chopped basil and salt and blend until smooth. Tranfer to a container and chill thoroguhly. Taste and add more salt if necessary. [admittedly, I skipped this step- and just ate with bread] To make croutons: preheat oven to 350. Cut the remaining slices into 1/2-inch cubes. Put remaining tablespoon of oil in small bowl. Place the bread cubes in bowl and light toss around so bread touches oil. Spread cubes on baking sheet and bake about 15 minutes until crispy and golden. Serve the soup garnished with a spoonful of red onion, green pepper, tomato and croutons. Gazpacho is one of those things that tastes even better the next day- when flavors have all spent the night together. My mother used to make this soup— a great, thick and hearty soup. A few weeks ago, my sister recreated it and had Terry and I over for dinner. Just as good as I remembered. It doesn’t make a huge batch- maybe 4 bowls, so feel free to double. Quick enough for a weeknight. 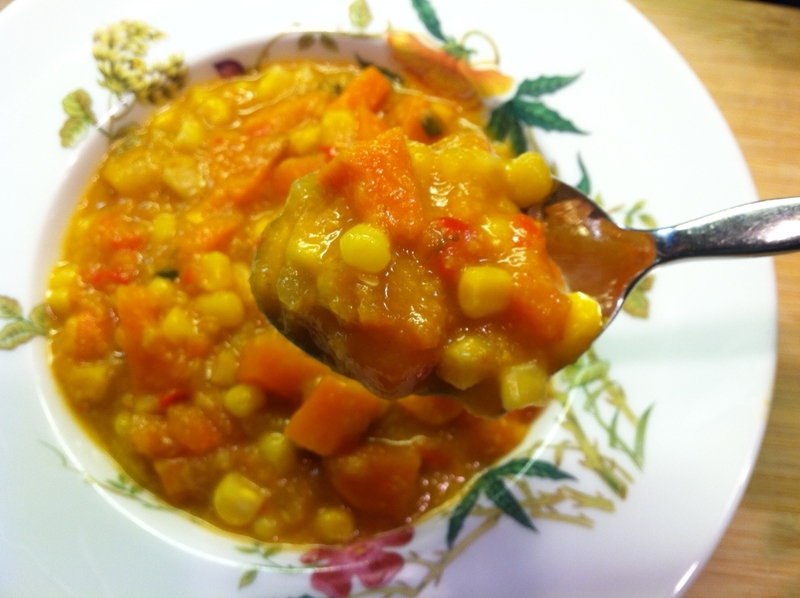 The recipe comes from Moosewood low-fat cooking– so it is healthy but still flavorful. Don’t skimp on the lime garnish- it is the perfect finish. Cilantro garnish good too. in a covered soup pot, simmer onions, garlic, chile and salt in 1 cup of veg stock for about 10 mins, or until onions are soft. In a small bowl, make a paste w. the cumin and 1 tablespoon of stock, stir into pot and simmer for another 1 or 2 minutes. Add sweet potatoes and remaining stock and simmer for about 10 mins, until sweet potatoes soften. Add bell pepper and corn and simmer, covered for another 10 mins or until all the vegs are tender. Puree about half the soup in a blender, food processor or using immersion blender. And return to put. The soup will be creamy and thick. Add salt to taste and gently reheat on low heat. Serve w. lime and cilantro garnish. Great served w. Kale Caesar- as Sam did- recipe to come.